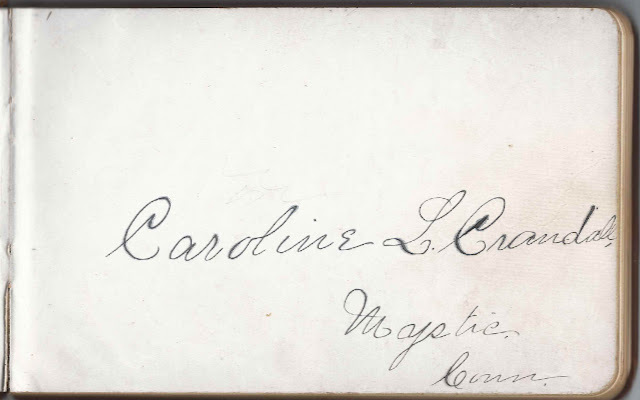 1880s-1905 autograph album of Caroline Lydia (Greene) Crandall of Mystic, Connecticut. See another post that features the 1870s autograph album of Caroline's son Stiles Ashbel Crandall, compiled mostly while he was a student at Connecticut Literary Institute. 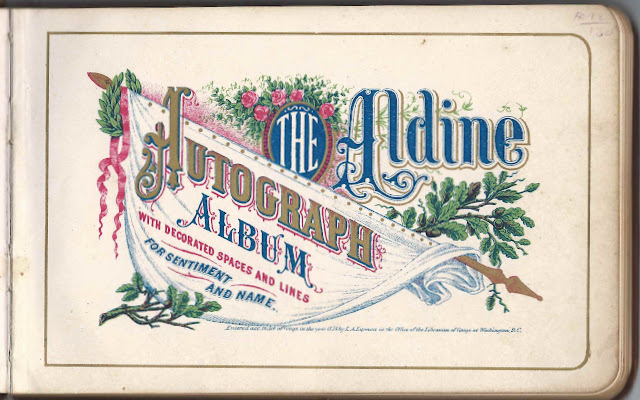 Several people signed pages in both albums. The album is approximately 8" x 6" and contains the sentiments of 68 of Caroline's relatives and friends. An alphabetical list of the signers appears at the end of this post. Caroline was a middle-aged woman while these autographs were collected, which fact might explain why numerous pages are signed by parents and their children. Caroline Lydia (Greene) Crandall was born 18 February 1826 at Stonington, Connecticut, the daughter of Stephen and Sarah (Bolles) Greene. On 1 January 1884, at Ledyard, Connecticut, Caroline married Stiles Woodbridge Crandall, son of Wells and Sarah (Woodbridge) Crandall. 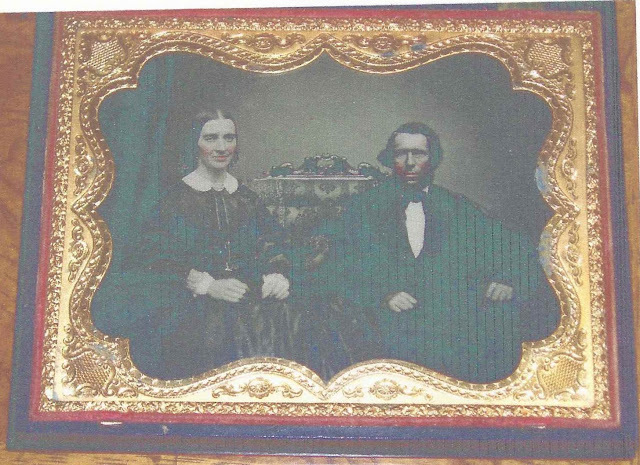 The album came with a print of what appears to be a encased photograph of a husband wife, presumably Caroline Lydia (Green) Crandall and Stiles Woodbridge Crandall, but I can't be sure. Caroline and Stiles had, I think, three children, a daughter Caroline Augusta Crandall, who died at about age 8; a son Ashbel Woodbridge Crandall, who died at about a year; and and the above-mentioned Stiles Ashbel Crandall, who lived a long and productive life. 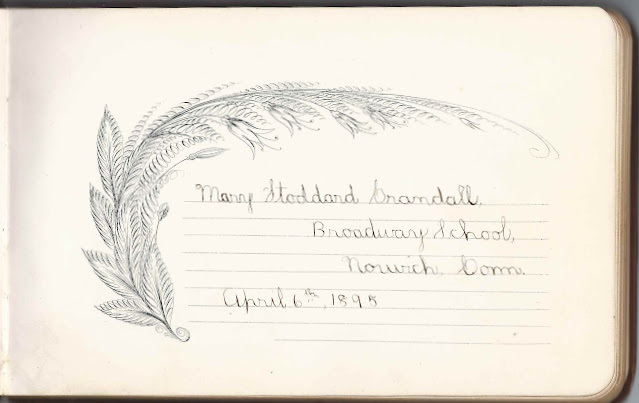 Ashbel Stiles Crandall's two children, Mary Stoddard Crandall and Billings Francis Stoddard Crandall, signed pages in their grandmother's album, Mary in 1895 and Billings in 1894. Caroline Lydia (Greene) Crandall died in 1912; her husband Stiles Woodbridge Crandall had predeceased her in 1906. One of the most interesting aspects of this album is the fact that several pages were shared by immediate families. Among those was the page signed on July 27, 1884 by William J. Brown and wife Jennie A. (Denison) Brown of Mystic, Connecticut. 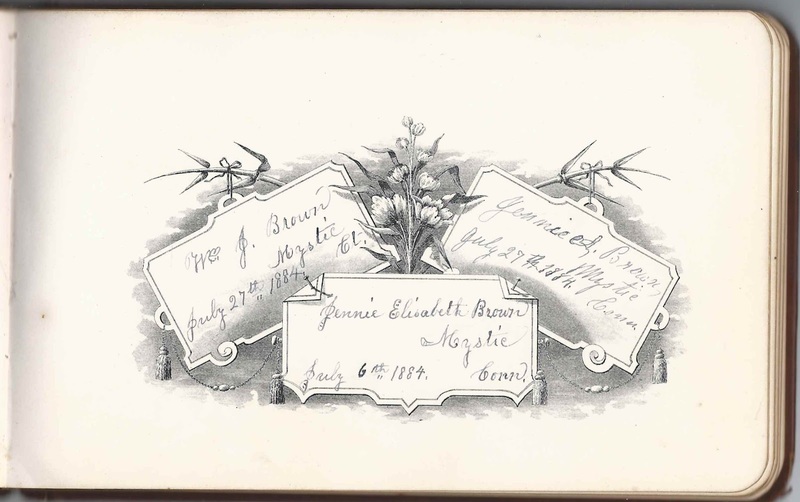 They wrote the name of their newborn daughter, Jennie Elizabeth Brown, born July 6, 1884. William J. Brown was the son of James and Sophia E. (Crandall) Brown, who was a sister to Caroline's husband Stiles Woodbridge Crandall. Another page featured the Watrous family Mystic, Connecticut: Albert Gallatin Watrous, his wife Susan Madilia (Lamphere) Watrous and their son George Arthur Watrous, who signed in 1882. The Whiting family of Mystic, Connecticut, also signed a family page in 1882. They were Nathan Palmer Whiting, his wife Mary Ann (Wheeler) Whiting and sons Nathan Palmer Whiting and Lewis Herbert Whiting. William J. Brown of Mystic, Connecticut, signed on July 27, 1884; shared the page with his wife Jennie A. Brown; they wrote the name of their daughter Jennie Elizabeth Brown, born 6 July 1884. William J. Brown was the son of William J. Brown and Sophia E. (Crandall) Brown. Sophia was a sister to Stiles Woodbridge Crandall, husband of album owner Caroline Lydia (Greene) Crandall. Jennie A. Brown of Mystic Connecticut, signed on July 27, 1884; shared the page with her husband William J. Brown; they wrote the name of their daughter Jennie Elizabeth Brown, born 6 July 1884. Jennie A. Brown was Jennie A. (Denison) Sabin Brown, daughter of Henry and Lucy (Smith) Denison and had been previously married to Charles Sabin. Albert Z. Brown of Ledyard, Connecticut, signed on July 20, 1884; his mother Sophia (Crandall) Brown was a sister to Stiles Woodbridge Crandall, husband of album owner Caroline Lydia (Greene) Crandall. 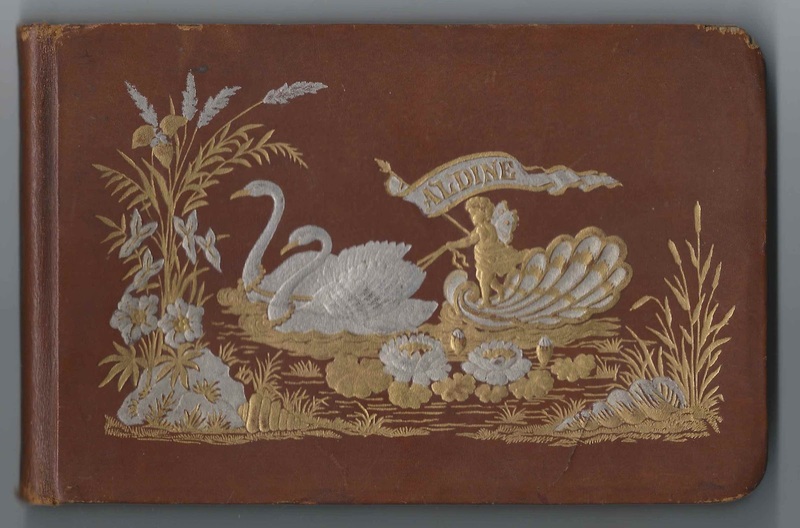 Jerome A. Denison of Ledyard, Connecticut, signed on December 9, 1882; his wife Mary J. Denison signed the right facing page. They spelled the name of their town as Ledgard. Mrs. Mary J. Denison of Ledyard, Connecticut, signed on December 9, 1883. Her husband Jerome A. Denison signed the left facing page. They wrote the town's name as Ledgard. L. M. G. Larrabee of Windham, Connecticut; presumably Lucy Maria (Gallup) Larrabee, whose husband Adam Larrabee signed the right facing page. 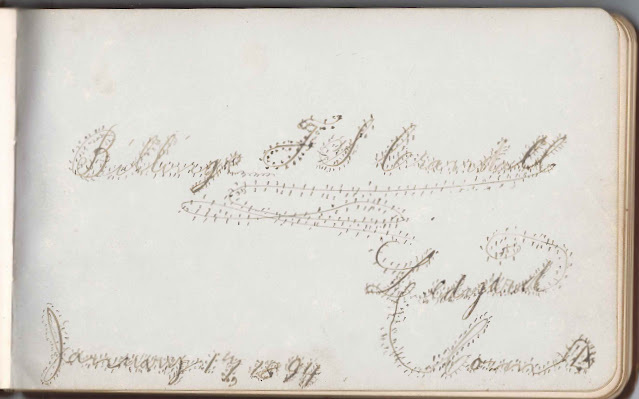 Adam Larrabee of Windham, Connecticut; his wife Lucy Maria (Gallup) Larrabee signed the left facing page. Rev. 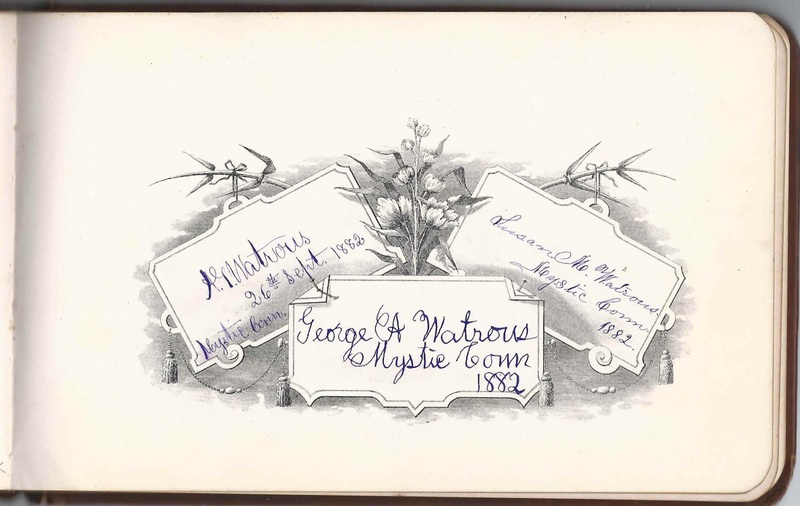 Albert E. Legg; his wife Bernice Hall Legg of Old Mystic, Connecticut, signed the right facing page which she dated December 20, 1900. Bernice (Hall) Legg of Old Mystic, Connecticut, signed on December 20, 1900; her husband Rev. Albert E. Legg signed the left facing page. A. H. Mott of Bay Sore, Long Island; his wife signed the right facing page. Mrs. A. H. Mott of Bay Shore, Long Island, signed on November 9, 1882; her husband A. H. Mott signed the left facing page. John W. Richardson of Mystic, Connecticut, signed on December 22, 1882; presumably Rev. John Wilbur Richardson, whose wife Florence A. (Dole) Richardson signed the right facing page. Florence A. Richardson of Mystic, Connecticut, signed on December 22, 1882; she was Florence A. (Dole) Richardson, whose husband, Rev. John Wilbur Richardson signed the left facing page. 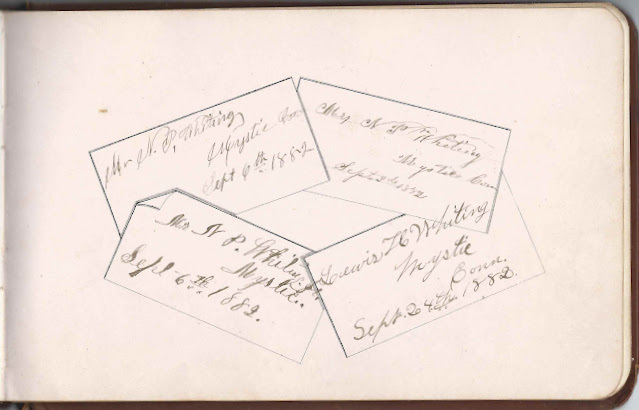 S. N. Williams of Mystic, Connecticut, signed on October 14, 1883; presumably Seth N. Williams, whose wife Mary Emma (Morgan) Williams signed the right facing page. 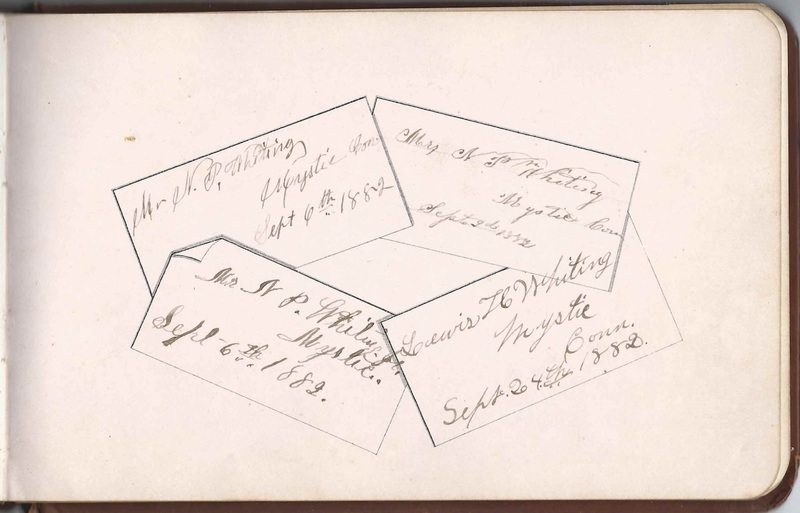 Mrs. M. E. Williams of Mystic, Connecticut, signed on October 14, 1883; presumably Mary Emma (Morgan) Williams, wife of Seth N. Williams, who signed the left facing page. G. Albert Williams of Providence, Rhode Island, signed on "8/3/82"